From an outside perspective it would be easy to dismiss the fashion scene as just another product of consumer culture, and perhaps in some regards this may be the case. After all there’s no doubt that some people will buy a brand simply to be seen in that brand, or thirst after a pair of shoes because their favorite rapper was rocking them at fashion week. And that’s totally fine, fashion is a form of artistic expression and there’s no right way to appreciate art, however it is important to remember that there is always meaning behind the clothing. It may not be particularly deep but something, somewhere, inspired the design of a piece. Whether it’s a tribute to a band, a celebration of a pop-culture icon or inspiration drawn straight from an OG garm, there’s usually more to a design than meets the eye. Clothing (particularly for those running independent brands) has always been a way for people to share their interests and passions, but perhaps more importantly, it has also regularly been used as a platform for activism. Throughout contemporary history designers have been raising awareness of key issues facing society and campaigning for social change all through their clothing. This is arguably more relevant now than ever, and while many brands and designers (Supreme, Brain Dead, Alex Olson, Bobby Hundreds etc.) have taken an active stance against many modern issues (such as right wing and extreme political views) few brands in the mainstream use their clothing as a platform for social change in the same that NOAH do. For those who may not know too much about the company, NOAH is a menswear brand based in New York who draws on classic subcultures such as the Punk Rock movement and New York Skate scene to create timeless clothing with a contemporary twist. Noah founder and head designer Brendon Babenzien opened his first store in 2015 (after an impressive 15 year run as design director of Supreme) with the hopes of breaking the conventions of how clothing is produced and consumed in the fashion industry. NOAH accomplish this, firstly, in their production process; all of their clothing is manufactured in factories around the world where workers are treated with dignity and paid a living wage, alongside this the brand use premium materials and sustainable manufacturing techniques. While this may lead to a higher price tag once the clothing hits the shelves, it is a certainly a more ethical business model. And it doesn’t end in the factory; Brendon and Co. use their clothing as a platform to raise awareness for social issues and injustice, such as the ongoing fight for civil rights in America, the mistreatment of the LGBTQ community and the impending threat of climate change. This year alone NOAH have contributed to organizations such as the ACLU (American Civil Liberties Union) and Sea Shepherd as well as raising money for the hurricane relief efforts going on in Puerto Rico, by donating money made through their clothing. Given Brendon’s love for the Punk Rock, skate and surf subcultures and his involvement in these scenes while growing up, it’s not wonder his clothing mirrors the “DIY” and counter-culture aesthetic that these movements were founded on. However in the case of NOAH the culture they are countering, is the fashion industry. Brendon has often spoken about his dislike for industry conventions and runs his own brand in the exact opposite way to the mainstream, combine this with the activism that helps gives NOAH their it’s identity and it’s clear that the influence of these movements has never gone away. In some regards this makes Brendon and his team “outsiders” within the contemporary fashion scene, however this just adds to the appeal of the brand. If you find some of the practices of the fashion industry (and consumer culture in general) unethical, it would be worth getting to know NOAH and the organizations they’re affiliated with. Thankfully NOAH aren’t the only brand taking this approach to their clothing, as more and more companies are beginning to think ethically when it comes to their design and manufacturing process. However they are the only brand doing it in such an effective way; season after season they’re putting out consistently high quality clothing that provides a refreshing twist on classic menswear pieces, all while simultaneously creating a large amount of hype. And the hype is very real. NOAH has a loyal following (shout-out NOAH Talk EU/UK) that is constantly growing; because of this they are becoming increasingly popular with younger people. While in some cases this could mean a risk of oversaturation and the inevitable “falling off” of a brand, this is actually a very good thing, as it means more people are being taught to think about how they consume, where their clothing comes from and the general social issues that are facing 21st century society. After all it will most likely be the younger generation that will help usher in lasting social change. The brand acknowledge that buying a t-shirt or hoodie that supports a good cause isn’t going to solve the problem forever, but simply raising awareness is better than nothing and slowly they are starting to make an impact. 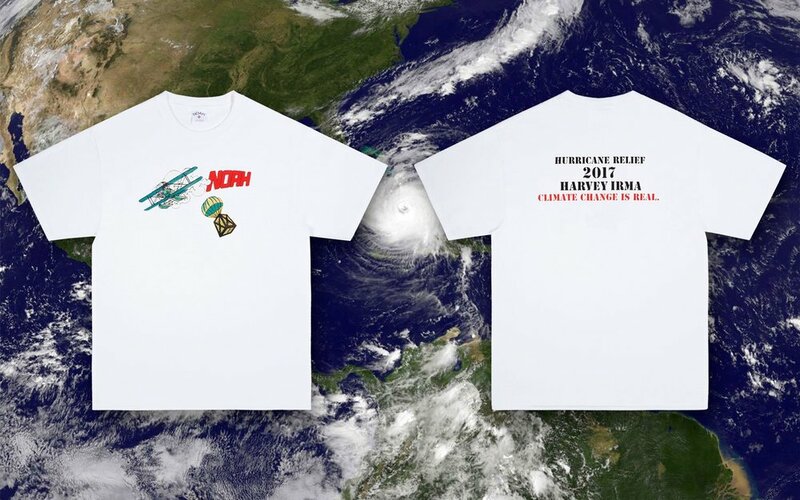 Their Hurricane Relief Tee that dropped in late September raised over $1500 for the people of Puerto Rico; at the time this was more than the President of the United States had done for the relief effort… So it goes to show social change is possible and that clothing is clearly an effective way of implementing it, and while it most likely take a while on a mass scale, brands like NOAH and the people they influence will continue to make an impact as much as they can, all while dressing well in the process.